When was the last time you sampled a Chocoholic Buffet? Took a vacation with your favorite football pro? Or watched a Broadway show 200 miles at sea? Cruise The Norwegian Way and you’ll sail as far from the everyday as a ship can take you. Modern ships are classically designed with elegant lounges, dazzling discos and acres of broad promenades and decks so there’s more room to roam, more places to get lost. You’ll also find more entertainment per nautical mile, an exceptional choice of dining alternatives and by far the best Sports Afloat®. From lavish spas to fully-equipped fitness centers, you’ll discover all the facilities of a fine land-based resort on a Norwegian ship. You can shoot a few hoops at the basketball court, swing a nine-iron, go for a jog or mingle with friends in the Sports Bar. The satellite TVs are equipped with ESPN International programming so you can keep up with your favorite teams back home. And when the sun goes down the fun keeps going with live music, variety acts, dancing under the stars, lavish Broadway musicals, and dazzling Las Vegas-style casinos with the friendliest dealers at sea. So whether you want to see glaciers in Alaska, the Byzantine treasures of Istanbul or go island-hopping from San Juan, you’ll enjoy an unrivaled cruise experience when you cruise The Norwegian Way. There’s no better way to travel. 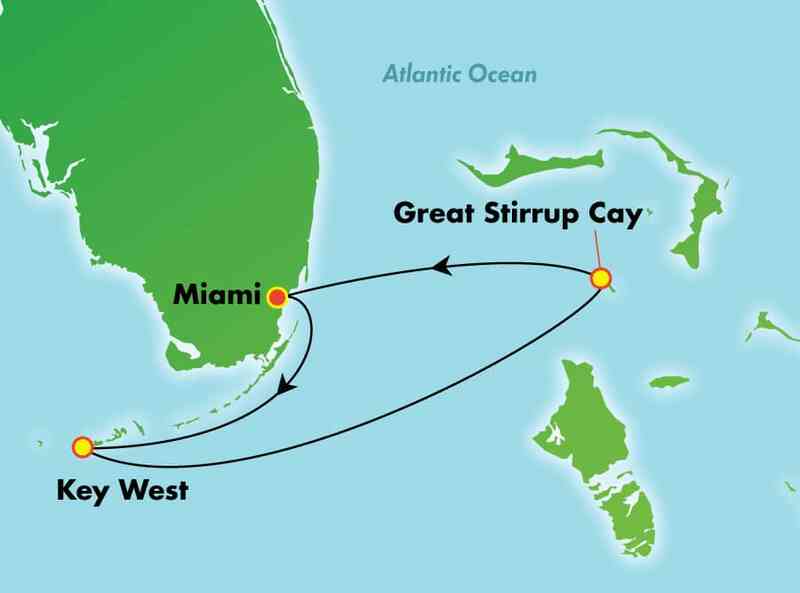 3 Night Cruise sailing from Miami roundtrip aboard Norwegian Sky. Free at Sea - Receive Up To 5 Free Offers! 3 Night Cruise sailing from Port Canaveral roundtrip aboard Norwegian Sun. 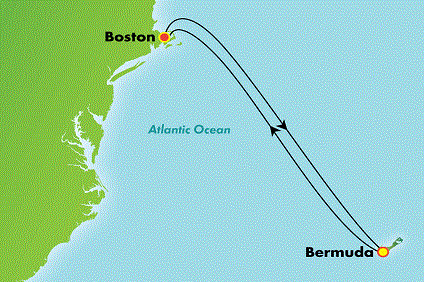 7 Night Cruise sailing roundtrip from Boston aboard Norwegian Gem. 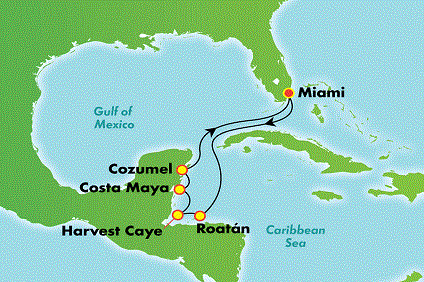 5 Night Western Caribbean cruise departing roundtrip from Miami onboard Norwegian Dawn. 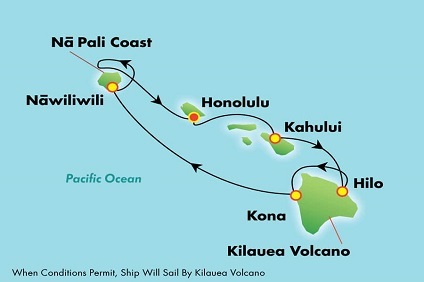 7 Night Hawaii Cruise departing roundtrip from Honolulu onboard Pride of America. Hawaii Free at Sea - Receive Up To 5 Free Offers! 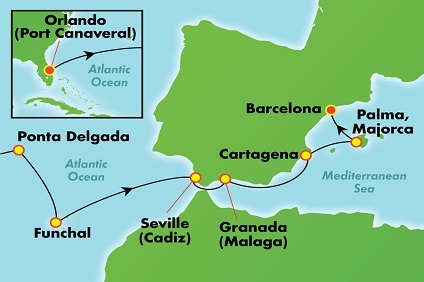 15 Night Cruise sailing from Port Canaveral to Barcelona aboard Norwegian Epic. 15 Night Cruise sailing from Miami to Barcelona aboard Norwegian Star. 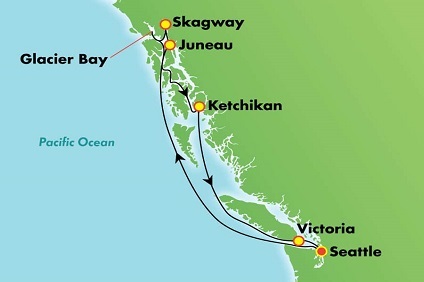 7 Night Cruise sailing from Seattle roundtrip aboard Norwegian Joy. 7 Night Cruise sailing from New York roundtrip aboard Norwegian Escape. 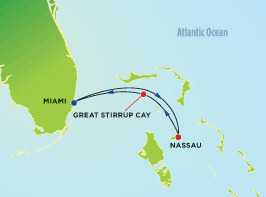 7 Night Cruise sailing roundtrip from Miami onboard Norwegian Breakaway. 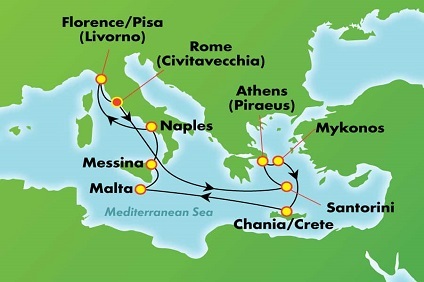 10 Night Cruise sailing from Rome roundtrip aboard Norwegian Spirit. 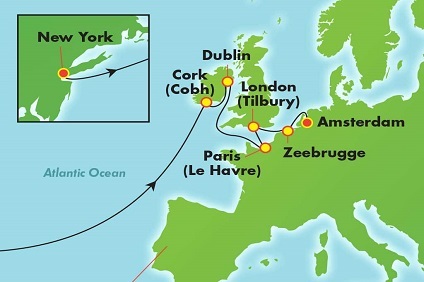 13 Night Cruise sailing from New York to Amsterdam aboard Norwegian Pearl. 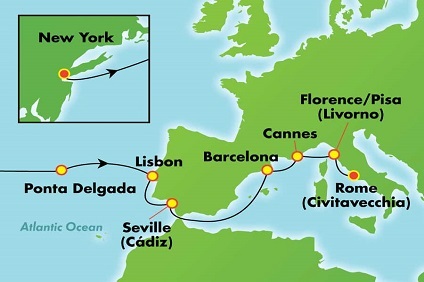 14 Night Cruise sailing from New York to Rome aboard Norwegian Jade. 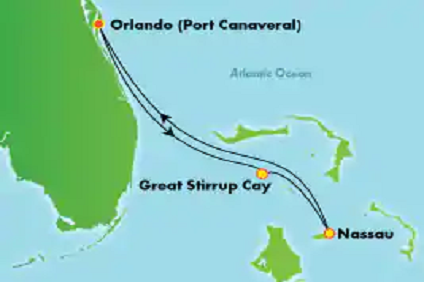 4 Night Cruise sailing from Port Canaveral roundtrip aboard Norwegian Sun. 4 Night Cruise sailing on Norwegian Sky from Miami roundtrip. 7 Night Cruise sailing roundtrip from Seattle aboard Norwegian Bliss. 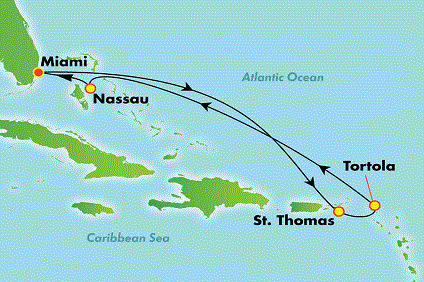 7 Night Eastern Caribbean cruise departing roundtrip from Miami onboard Norwegian Breakaway. 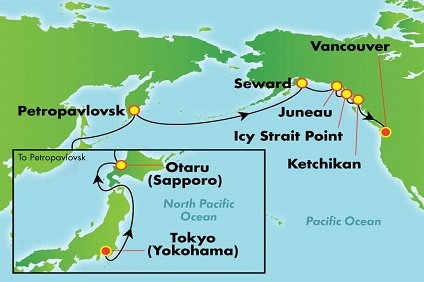 15 Night Cruise sailing from Yokohama to Vancouver aboard Norwegian Jewel. 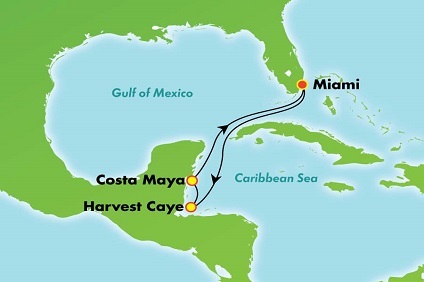 3 Night Cruise sailing from Miami roundtrip aboard Norwegian Dawn. We believe lunch is when you're hungry. Same goes for breakfast and dinner. You'll never have to drag yourself out of bed for a forced breakfast seating at 7:45 am or interrupt whatever you're doing so you can make it to a dinner seating precisely at 5:45 pm. We also think you should eat with whomever you want so we'll never choose your dining partners for you. Want to meet someone new? We can arrange that, too. Don't be misled by other cruise lines' dining "options." They really come down to some fast-food choices or one big dining hall where you often have to eat with strangers. NCL has a wide variety of actual restaurants with great, new signature dishes in every one. And, with up to 13 different restaurants and dining rooms on board, like Le Bistro, our exclusive French bistro, and Cagney's, our scrumptious steakhouse, you'll find something to satisfy your every craving, every night of your cruise. Steak and a dry martini after a great day of snorkeling. Sushi to follow lounging by the pool all day. French or Mediterranean after a long day of shopping. Tapas or Tex-Mex before you hit the casino. Pasta and a nice bottle of wine post-sightseeing. Teppanyaki between swimming and checking out the jazz singer. Made-to-order specials at the buffet's action stations when you're finished with your massage. Burgers and pizza to celebrate your youngest's birthday. Or perhaps the most romantic meal of all served in the private seclusion of your balcony. With so many delicious choices, you can certainly eat whatever you want. Freestyle Cruising is not too dressy, not too casual. We call it "resort casual." You'll call it being on vacation. By day, almost anything goes. Khakis, skirts, jeans, casual tops, shorts, or whatever are all fine. Casual is perfect in our restaurants too. Even if you've just been at the pool and don't feel like changing, now worries. Swimwear with a cover-up is fine at the buffet and outdoor restaurant. At night, it's relaxed all over the ship. When you're ready for dinner, it's collared shirts and pants or nice jeans for guys. Slacks or jeans, dresses, skirts and tops are perfect for women. Kids 12 and under are welcome to wear nice shorts in our restaurants whenever. If you want to dress up and add a little glamour when you dine out, feel free - we've reserved a restaurant just for that. And remember to pack a sweater - air conditioning can be chilly. Forget about those cafeteria lines. Our buffet has a huge, new salad bar and "action stations" where you can get made-to-order specialties. Start your day with freshly squeezed juices, a Bloody Mary or a refreshing Bellini. Have meat carved exactly to your liking or choose your favorites to be thrown on the grill. Enjoy a pasta dish made with all of your favorite ingredients, then try sweet dessert crepes with fillings of your choice. You can even whet your appetite the day you board with a sampling of dishes from all of our great restaurants, and, when you need a little boost or just a place to relax, head to the Java Café for delicious Lavazza coffee drinks and special desserts. Lobster lovers of the world will rejoice because we have lobster dishes in every specialty restaurant on board, every single night. And choose one night of your cruise for an absolute lobster feast. Breakfast doesn't stop being the most important meal of the day just because it's the last day of your trip. So take your time. Relax. Enjoy a delicious breakfast and start your day off right. Leave the waking up super early, waiting in a crowded public area then waiting some more to the other cruise lines. When it's time to go, we'll let you know. Guests should not feel obliged to offer a gratuity for good service. However, all of our staff are encouraged to "go the extra mile," and so they are permitted to accept cash gratuities entirely at the discretion of our guests who wish to acknowledge particular staff members for exceptional or outstanding service. In other words, there is genuinely no need to tip but you should feel free to do so if you have a desire to acknowledge particular individuals. Also, certain staff positions provide service on an individual basis to only some guests. We encourage those guests to acknowledge good service from these staff members with appropriate gratuities. For example, for guests purchasing bar drinks the recommended gratuity is 15 percent. For guests purchasing spa treatments the recommended gratuity is 18 percent. Similarly, for guests using concierge and butler services, we recommend they consider offering a gratuity commensurate with services rendered. On all NCL ships payment of Pre- Paid Service Fee is required. A fixed Service Charge of US$12 per person, per day will be added to your onboard account. For children ages 3-12, a US$5 per person per day charge will be added to your onboard account: there is no charge for children under the age of three. Our crew is encouraged to work together as a service team and compensated by a combination of salary and incentive program that the Service Charge supports. It is our earnest wish that you enjoy your Freestyle Cruise experience and that our entire crew in all areas of the ship will provide you with the standard of service for which NCL is known. Therefore, if you have any concerns about the service you receive during your cruise; please bring them to the immediate attention of our reception desk staff on board so that we can address any issues in a timely manner before the cruise is over. Both NCL and NCL America have a structured guest satisfaction program on board designed to handle any concerns raised by our guests relating to the service or on board product quickly and efficiently. In almost all cases we are able to come up with a satisfactory solution to any issues which are raised and make sure our guests can focus on enjoying their cruise holiday. In the unlikely event we cannot satisfactorily resolve the issues through our guest satisfaction program; guests will be able to adjust the Service Charge according to the level of inconvenience they feel they have experienced. Our clear priority is to have the opportunity of resolving the issue, when it happens, to everyone's complete satisfaction. And who said cruises aren't for kids? It's our middle name. NCL offers what you want, what your kids want- good times all around, for all ages, at all times, just the way you like it. Plus, complimentary activities happen every day- whether your child wants to paint, have a pajama party or put on a show. And just think of the new friends they'll make- you might even have to schedule time just to see them. We like our Youth Staff because they are carefully chosen from Education and Recreation programs at their University. Your child will like our Youth Staff because they are fun. Actually, they are experts in fun- they design specialized activities for all ages. And they'll keep a constant watch over your children to make you happy. Not to mention, each staff member is CPR and First Aid certified, so your child will be safe and secure at all times plus they're trained in communication and confidence building too. A parent or guardian is required to register kids ages 2-17. After registering, kids can participate as often as they choose. *Your child will be assigned to an age group based on his/her age at sailing. If they have a birthday while at sea, only then they are moved up. Sorry, no exceptions can be made-this helps keep your child safe. *Kids under 13 may not sign themselves in and out. Only a designated adult over 21 may sign them in and out of Kid's Crew. Until our Youth Staff gets to know you, have a photo ID ready for drop off or pick up. *We're flexible. Our activities and programs are subject to change to accommodate a child's needs. *Sorry, we are not able to have one-on-one care within our Youth Programs. *Leave the flip-flops and sandals in your stateroom-we play hard and require proper footwear. *We are not able to change diapers or pull-ups, but we leave you with a beeper to alert you to do the duty. Beepers do not work ashore, so parents will have to stay onboard when their children are in our Youth Program. *Your child not feeling well? Sick children need to see the medical center before coming to the program. There's no charge if your child is well and is allowed to join the activities. *Please let us know if your child has allergies or note any medications on their registration&we like to have snacks and will need to know. *Want to involve the whole family? Great activities are offered throughout the cruise including Pizza Making. Just remember, a parent is required to attend with a child to participate. *Because our Youth Staff is not included in onboard gratuities, cash gratuities are divided among the staff and greatly appreciated. Individual gratuities can be made through the onboard Reception Desk. Relax-it's your job to have fun and our job to keep your kids happy and safe. Every child in our Program receives a Kid's Crew bracelet with their name, stateroom number, emergency station, allergies, and medications listed. If an emergency does occur, our Youth Staff is responsible for the mustering of the child in their care and bringing them to safety at the Child Muster Station. There, you can claim your child. All unclaimed children will be taken to the secondary station and distributed to their assigned lifeboat stations. Need a little more "me" time? We offer more supervised fun for the kids. The "Late Night Party Zone" and "Port Play" are both group-sitting services for kid's ages 2-12. The Youth Staff runs these activities in the Kid's Crew Facilities and all the requirements and procedures apply. The "Port Play" is offered from 9am-5pm and we accommodate those parents booked on Shore Excursions. Sign up is 8pm the evening prior to the desired "Port Play". The "Late Night Party Zone" is offered nightly from 10pm-1am. The charges are US$5.00 per hour, per child, and US$3.00 per hour for each additional sibling in the same immediate family. Charges are applied directly to your onboard account. Sign up is 8pm the evening prior to the desired "Late Night Party Zone". A reminder, if your child requires you to keep a beeper, a parent or guardian must stay behind on the vessel during either activity, as our beepers do not work off the ship. Also, no private or in-stateroom babysitting is available on any NCL vessel. Your children are important to us. We want your kids to have as much fun and be as safe as possible. Here is our four-step Discipline Policy to ensure this happens. STEP 1: Warning: The Youth Counselor addresses the child and it is explained that his/her behavior is unacceptable and needs to be improved immediately. STEP 2: Time out: If the child continues to disobey the Youth Counselor, a time out is issued and the parents are notified at pick-up time. STEP 3: Suspension: If a time out is not effective in eliminating the inappropriate behavior, the parents are located and the child is grounded from the program for 24 hours. The child is then welcomed back, but if there is any reservation on the part of the Youth Counselor a parent may be required to attend with their child. STEP 4: Dismissal: Once the child is allowed back into the program after the initial dismissal, if any disobedient behaviors continue, the child will no longer be allowed to participate. Cannon balls welcome here. Just for our Junior cruisers, we offer splash pools on Norwegian DAWN, STAR and SPIRIT. Each ship has its own children's themed wet and wild fun areas slides, water squirters, and splash areas far away from mom and dad's main pool area. Think about this we have arcades on every ship, but the bigger the ship the bigger the arcade and how much fun can you have in a day! Move over Tarzan, we got kids coming in! NORWEGIAN DAWN, STAR, SPIRIT, JEWEL, PRIDE OF AMERICA, and PRIDE OF HAWAII offer jungle gyms with ball pits and tunnels. Just check out our Kid's Crew facilities registered participants can jump in anytime. Time to go surfing? Our onboard Internet Café is perfect for kids to send emails to friends, access AOL accounts and just surf the net. Basic time charge is .75 per minute and we offer great packages too. Parents wishing to block their children from Internet access can do by requesting the ship's Internet Café Manager onboard to de-activate their accounts. Our staterooms are designed with your family in mind just the way you like them. Not a lima bean in sight we give kids what they want to eat all day long in our Kid's Café our newest addition to the fleet: the NORWEGIAN DAWN, STAR, AMERICA, JEWEL and all of our future ships. Kids can dig into our Kid's Buffet: sandwiches, hot dogs, fruits, yes, some veggies, French fries and cookies. They'll love the tables and chairs just their size too. Plus each itinerary offers a special Kid's Crew Dinner sorry mom and dad, it's kids only this time. Sign up with the Youth Program staff. Break some ice here. Our Teen Program is a great way for teens ages 13-17 to meet each other while engaging in some cruising fun. A member of our Youth Staff supervises all activities. They know what teens want to be doing and design all programs accordingly. Enjoy theme parties, sports events, dining together or taking in a show as a group. 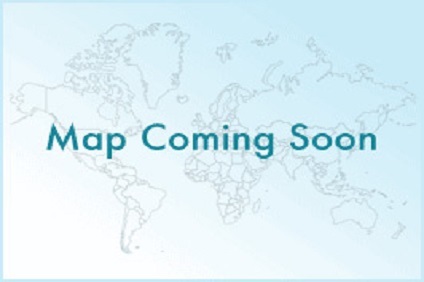 Activities are flexible and subject to change based on participants. *We reserve the right to cancel if no teen shows within the first 15 minutes of the scheduled activity. Teens will meet at the next scheduled activity. *Teens not feeling well need to visit the medical center before being admitted to the program. *Guardians must alert the Youth Staff of any allergies, medications or special needs of their teen when registering. *All Teens are responsible for any personal items brought to activities and events. *NCL strongly encourages that no teenagers go ashore alone in the ports of call. *If you have any questions, please see the Youth Program Supervisor. *Teens are responsible for reporting to their assigned emergency stations in the event of a ship emergency. Crew members throughout the vessel are trained to assist those in need. *Teens participating in Teen's Crew are prohibited from smoking, drinking alcohol, and using profanity while attending Teen activities. *Violence and vandalism will not be tolerated, ever. *A Teen exhibiting inappropriate behavior will be asked to stop immediately. If they do not stop, they will be dismissed from the activity. *After dismissal, Parents and the ship's Security will be notified. *Any behavior reported to a Youth Staff member taken outside of the Teen Program will also be reported to Security. *Teens should be advised that all public areas are under 24-hour surveillance.